If you have a little bit of experience with a jig saw, you can transform a simple shelf into an efficient wall bike rack that will allow you to hang everything, from your bike to your helmet and bags! This step-by-step guide will show you how to build an attractive and practical shelf to keep your cycling gear organized. This design allows you to hang your bike by the saddle, meaning you can hang any type of bike! 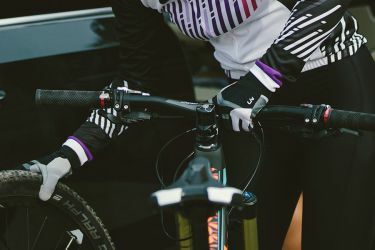 Many similar bike racks use the toptube, which isn’t possible with cruisers, mountain bikes and many compact road and commuter bikes that have sloping toptubes. We also love the accessory hooks tucked conveniently behind the bike and shelf-top storage. Jackets, bags and helmets will be neatly displayed as a space-saving part of your apartment or home décor. The great thing about this small shelf is you can use scrap wood to save money or buy pre-cut pieces from the hardware store to make the project quick and easy. If you are using scrap wood, trim the wood to the appropriate sizes so edges are smooth. Grab the 17 X 6 inch (43 X 15 cm) piece of wood and begin to mark it with desired design. We used a 1-inch drill bit that is the same width as we would like our accessory hooks to be to help measure our layout. We also used a paint can to draw the round bottom of the hole we will use to hang our saddle. Use a drill to make holes in each corner of the saddle and accessory hooks. This will make the corners round and serve as guides. Use a jigsaw to cut out the hole for your saddle and accessory hooks. Now, move to the top of your shelf. Grab the 20 X 17 inch (51 X 45 cm) piece of wood and use the same paint can to draw in rounded corners on the side that will not be next to the wall. Use a jig saw to cut along your guide line. Using cabinet assembly screws fasten the 17 x 6 inch (43 X 15 cm) piece of wood to the center of the 20 x 6 inch (51 X 15 cm) piece. Once secure, lay the top on and fasten to both pieces of wood with the same type screw. Use body filler to fill screw holes if you’re going to paint the shelf or wood filler if you plan to stain. Paint or stain the wood as desired and let dry before installing. Using a ruler, mark two spots for screws equidistant from the edges of the shelf in the center of the backing. Drill pilot holes using a drill bit the same diameter as the shank of the screw. Whether you are using a stud finder or toggle bolts, use a level to ensure your shelf is straight horizontally before marking your wall and mounting the shelf. Secure the shelf to the wall using cabinet screws and hang your bike by the nose of the saddle. Adorn your shelf with decorations and/or cycling gear. Nice job!